The CFAES Distinguished Senior Award honors academic, disciplinary and professional excellence in the College of Food, Agricultural, and Environmental Sciences (CFAES). It is the most prestigious undergraduate award in CFAES, recognizing our top graduating seniors each year from each of the academic units on the Columbus campus. The selected students’ accomplishments and activities have benefited their communities, their academic unit, the college, the university, and/or their future profession. 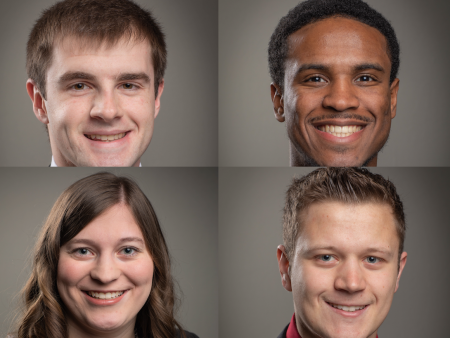 Justin Haerr, Emanual Barnes, Jenna Lee, and Joseph Smith were selected as the award recipients from the Department of Food, Agricultural and Biological Engineering (FABE). Haerr is an agricultural systems management (ASM) major from Clark County, Ohio. During his time at Ohio State, Haerr has distinguished himself as a leader in the ASM program through his leadership roles in the ASM Club, as a CFAES Ambassador, and undergraduate teaching assistant. After graduation, Haerr plans to return to his family’s grain operation to handle the crop production portion of the farm. He also sees an agronomic consulting business in his future thanks to some of the courses he took. Emanuel “Manny” Barnes IV is a construction systems management (CSM) major from Canal Winchester, Ohio. Barnes is a current member of the Army National Guard and former president of the CSM club. Over the course of his time in CSM, Barnes has participated in four internships and some of Ohio State’s award-winning CSM competition teams. of student veterans and serves as the Veterans Community Advocate for the college. In this role, he works to bring members of the military and veterans from across the college together to engage and support one another. Barnes hosted events to build community, such as a veteran’s woodworking workshop before winter break. After graduation, he plans to work with Turner Construction Company as a virtual design and construction engineer. Lee is a FABE major with a specialization in agricultural engineering from Marysville, Ohio. Lee has been involved in the American Society of Agricultural and Biological Engineers (ASABE), CFAES Ambassadors, the Ohio State Society of Women Engineers, the Ohio State Agribusiness Club, and Ohio State Welcome Leaders. As an undergraduate research assistant with the Ohio State Digital Agriculture program, Lee has sought to help farmers throughout Ohio better understand new technologies and determine which are most useful to their operations. She also worked on the 2017 and 2018 eFields report, which compiles on-farm research studies throughout Ohio. After graduation, Lee plans to either work in an industry role that connects farmers and engineers for the betterment of digital and precision agriculture or pursue graduate school in precision agriculture. Joseph Smith is a FABE major with a specialization in ecological engineering from Columbus, Ohio. Smith will graduate this spring with two bachelor’s degrees, in FABE and Mandarin Chinese, and is currently pursuing his master’s degree in FABE. Smith is an honors student, Morrill Scholar, and member of the men’s varsity gymnastics team, where he specializes on the high bar and has been named a Big Ten Champion and Varsity “O” member. Smith has also been engaged in undergraduate research during his time at Ohio State. His research poster placed 3rdat the 2019 Denman Undergraduate Research Forum in the Evolutionary Ecology and Environmental Sciences category. His research project was titled “Seasonality of Nutrients in Stormwater Runoff from Residential Sewersheds in Columbus, Ohio,” where he worked with Drs. Ryan Winston and Jay Martin on data collection and analysis for this project. After graduation, Smith will continue his graduate education at Ohio State to earn master’s degrees in FABE and Mandarin Chinese. He hopes to use his engineering skills to help others abroad and plans to return to China to work, with an ultimate goal of becoming a professor. In addition to the four award recipients, nine students have also been recognized by FABE as finalists due to their exemplarily student achievements. John Hagan, CSM major, has been active in several of the CSM program’s competition teams, even coaching the 2019 New Builders Competition team in the heavy civil division. Kendra Harder, FABE major specializing in biological engineering, has striven to take her education outside the classroom. She has participated in a Humanitarian Engineering Scholars service-learning trip to Panajachel, Guatemala and working with Honda R&D on a capstone project. Haley Jenkins, FABE major specializing in ecological engineering, has been very involved on campus thanks to the Environment and Natural Resources scholars program. She was also a research assistant for Dr. Jay Martin, and several other research projects during her time at Ohio State. Bradley Kelley, CSM major, worked in the construction industry for eight years before enrolling at Ohio State. As a student, Kelley has participated in two CSM competition teams and strived to be a role model to the younger students in the program. Hannah Margino, FABE major specializing in food engineering, has been President of Kappa Delta sorority and is currently a program coordinator for the Aspiration for Women’s Advancement and Retention in Engineering and Science (AWARES) program. After graduation, she will work full-time on the technical training team at Niagara Bottling and manage projects at plants across the country. Claudia McAllister-Peterson, FABE major specializing in ecological engineering, credits much of her undergraduate success to her mentors: Drs. Andy Ward, Margaret Kalcic, and Xiaoqiang Liu. After graduation, she plans to use her education to better the world through addressing food insecurity and water quality issues in the great lakes region. Gaoshoutong Si, ASM major, is also pursuing both his bachelor’s and master’s as part of FABE’s combined program. He hopes to continue his education focusing on precision agriculture and sustainable farming. Sokchea Som, FABE major specializing in biological engineering, is passionate about applying her education through humanitarian engineering. She is also an active member of Phi Sigma Rho and the Society of Asian Scientists and Engineers. Alexander Wynn, ASM major, is an active member of the ASM Club and Ohio State’s 1/4-scale tractor team. After graduation, Wynn hopes to stay self-employed and expand his welding and fabrication business.